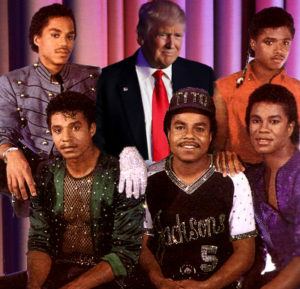 LOS ANGELES, CA – The Jacksons have filed a trademark lawsuit against Donald Trump and his transition team, claiming Trump’s ‘Victory Tour’ infringes on their legacy to the name. Jermaine, Tito, Jackie, and Marlon Jackson filed the amended complaint in civil court Thursday, stipulating that they own exclusive rights to the name after their highly successful 1984 tour of the same name. “The Victory Tour was a celebration of our reunion with our brother Michael, not a transgression of chaos, confusion, and horrible taste in women and hairstyles.” Jermaine Jackson was quoted. The 2,345-page complaint seeks damages of emotional distress, defamation of character, copyright and trademark infringement, and unspecified punitive damages of more than $500 million. Randy Jackson, who was also an official member of the group, was not a part of the lawsuit. “I got better things to do than chase imaginary pop star dreams of a solo career denied.” he said to reporters Friday. Donald Trump and his supporters are unavailable for comment.